Rene Portland coached Penn State from 1980-2007. 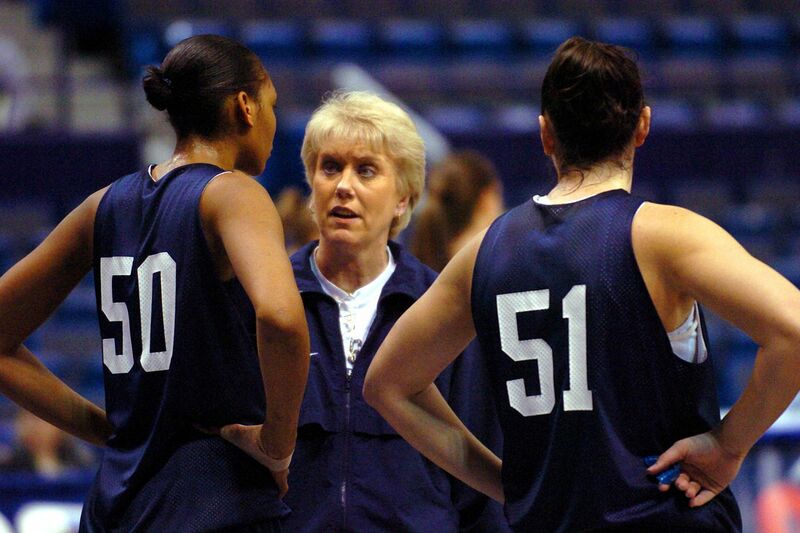 Former Penn State women's basketball coach Rene Portland, 65, who built the Lions into a national powerhouse in her 27 years in Happy Valley, died at her Tannersville home in the Poconos on Sunday morning after a three-year battle with cancer. Mrs. Portland, who grew up in Broomall, Delaware County, was also one of the key players during the Immaculata "Mighty Macs" championship era of the 1970s under Hall of Fame coach Cathy Rush. Mrs. Portland's death comes less than a year after her induction into the Philadelphia Sports Hall of Fame last November, when she joined Rush and former Macs teammates Theresa Grentz and Marianne Stanley, who were previously honored. That was also the last time she was seen in the general public — making an acceptance speech and appearing to have come back strong from her 2016 diagnosis of peritoneal cancer. Several weeks later, the cancer returned with a vengeance, and she began to weaken. She recently started receiving hospice care after her condition worsened. But in May, Mrs. Portland, whose maiden name was Muth, managed to attend the graduation of her daughter, DeLisa, from Cabrini University. "Rene fought a courageous and determined fight against her cancer," said former Virginia coach Debbie Ryan, herself a survivor of the disease. "She will be remembered as someone who gave her life to her family, her teams and her women. As a player, she was a fierce competitor at Immaculata, and she carried that trait into her coaching career. She was a wonderful wife, mother, grandmother and friend who will be missed." Mrs. Portland finished with a 606-236 record for Penn State, a stretch that included allegations that she discriminated against lesbian players. She resigned in March 2007, not long after an out-of-court settlement with a former player who alleged that Mrs. Portland had dismissed her from the Penn State team in 2005 as part of the coach's "no-lesbian" policy. Rush recalled Mrs. Portland's playing career, saying, "Rene Portland was the player every coach needs. She was a coach on the floor for our team from the time she started her first game. "Rene brought an unbelievable understanding of the game to her teammates. No surprise she became a great coach." Rene Portland (left), with some of her Immaculata teammates during the Mighty Macs’ championship run in the early 1970s. Mrs. Portland's coaching career began alongside Rush, assisting on the team that played in the AIAW national championship game — coincidentally at Penn State — in 1976. Then it was back home to run her first program: on Hawk Hill at St. Joseph's. She led the team to the finals of the AIAW tournament with a 23-5 record in 1977 when the field was still 16 teams. One of her stars was Hall of Famer Muffet (O'Brien) McGraw, who went on to coach Notre Dame to NCAA championships in 2001 and this past spring. Mrs. Portland also coached several squads for USA Basketball, earning a gold medal in 1997 in the Junior World Championships, now called the FIBA U19 World Cup. "Rene Portland was a great ambassador for women's basketball when the game was in its early stages," St. Joseph's coach Cindy Griffin said. "The support she garnered in her Penn State community was astounding. Penn State fans followed the Lady Lions because of Rene Portland's success on the court. She will be greatly missed." After two seasons with the Hawks, Mrs. Portland was invited to interview at Colorado, but before leaving, she couldn't envision anything better than her current job. Allaying concern by university officials, Mrs. Portland said, "Don't worry, I'm going to ask for the world." Two days later, she returned, saying she took the job. "I asked them for the world and they gave it to me," she said. Her stay in the Rockies lasted just two years. Penn State football coach Joe Paterno, then also the athletic director, targeted Mrs. Portland for his women's basketball vacancy, and thus began a 27-year life in Happy Valley. It was Paterno's only hire as AD. Penn State coach Rene Portland (right), hugging Kelly Mazzante during an NCAA Mideast Regional game in March 2003. During her time, the program moved out of old Rec Hall to the vast confines of the Bryce Jordan Center, which became known as one of the toughest home courts in women's basketball. She won 72 percent of her games with the Nittany Lions, and when she earned her 600th victory, she became only the ninth coach to achieve the milestone. Her overall coaching mark, over 31 years, was 693-265 (.723). She was Big Ten coach of the year four times and national coach of the year twice. When Mrs. Portland first was taken ill, family and friends kept her situation low-key by using a group messaging system to keep those close to her updated. But recently, without going into great detail, the Women's Basketball Coaches Association sent a communique to members containing an address to send Mrs. Portland well wishes. "Rene Portland was a pioneer of our game in the modern era," said Danielle M. Donehew, the WBCA's executive director. One of the players Mrs. Portland coached at Penn State was her daughter Christine, one of her and husband John's four children (DeLisa, John Jr. and Stephen are the others). Several years later, when Christine married and had her first child, Mrs. Portland quipped to a writer, "Find out if I'm the first grandmother to coach in Division I." By and large, most of Mrs. Portland's players have spoken of her in endearing terms. "If I had to choose a college all over again, I would still choose Penn State," Downingtown High graduate Tina Nicholson said recently. "Rene had such an impact on me on and off the court. "We didn't always see eye to eye, but as an adult, I thank God for her. I love my coach, a great coach but an even better person. I've texted her about once a month to tease this great lady as my second mother." Rene Portland (left) listening to team captain Amanda Brown answer questons during Penn State media day in October 2005. "She taught us to play for something bigger than ourselves. She taught us to play for each other, to represent those who have impacted our lives, and to play for Penn State." Even though not many of her contemporaries knew of Mrs. Portland's struggle with the illness until recently, there was wide reaction when the news of her death became public. "When I think of Rene, I really don't go to the athletic world right away," said Dan Durkin, a Penn State assistant coach from 1985 to 1993. "My first thoughts go to what a loving and caring daughter, sister, wife, mother and grandmother she was. "She always put her family first. Rene's mother, affectionately known as `Granny' to most people, really taught her that virtue. And she certainly lived up to those teachings." In addition to her husband and four children, Mrs. Portland is survived by seven grandchildren and many nieces and nephews. Funeral arrangements in Broomall are pending.